September 26, 2018, 7:42 a.m. Ever since 2009, the UK has celebrated Armed Forces Day on the last Saturday in June. The event, itself an extension of the three year old Veterans Day celebration, was implemented to raise awareness and appreciation for those who serve in Britain’s armed forces. Members of the armed forces – especially in the United States, but also in Britain – are often referred to as heroes. But a BBC documentary in 2015 uncovered that many veterans feel uncomfortable with being described as heroes. 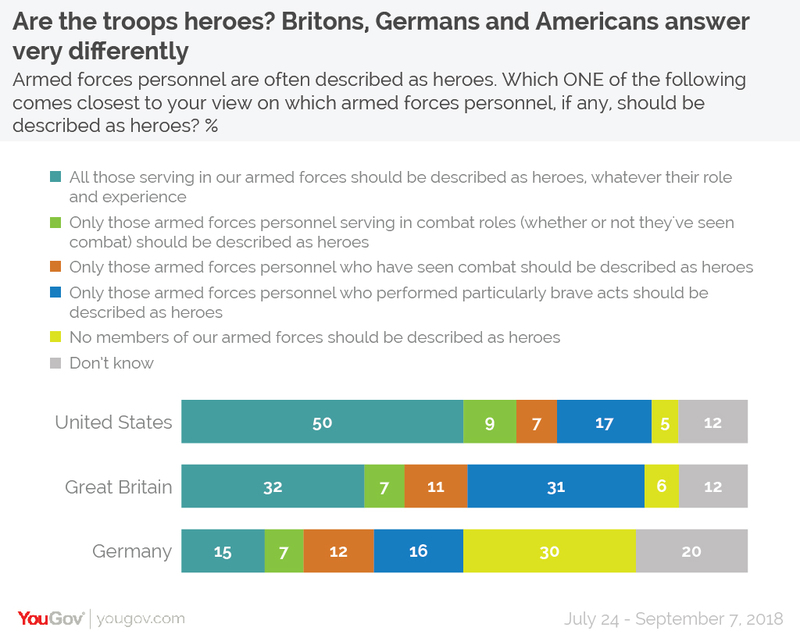 Now a new YouGov study conducted in the United States, Great Britain and Germany uncovers drastically different attitudes in each country towards which troops, if any, people consider to be heroes. The survey asked which members of the armed forces, if any, should be considered heroes. The response is most unified in the US: 50% of Americas say that everyone serving in the armed forces is a hero, regardless of their role or experience. Britons are split. One third (32%) also consider all armed forces personnel to be heroes, while an opposing third (31%) believe that only those armed forces personnel who have performed particularly brave acts should be described as heroes. In Germany, the most common response was that no members of the armed forces should be described as heroes. Three out of every ten Germans (30%) gave this answer. By contrast, only 5% of Americans and 6% of Britons said the same. In the US older Americans are most likely to describe all troops as heroes, while younger Americans are less sure. Among Americans aged 40 and over, 55-57% say that all armed forces personnel should be described as heroes, compared to 44% of 30-39 year olds and 37% of 18-29 year olds. For their part, younger Americans were more likely to answer either that only those serving in combat roles should be described as heroes (12-16% of the under 40s compared to 6-7% of the over 50s), or simply answered “don’t know” (16-21% of the under 40s compared to 5-8% of those aged 50+). 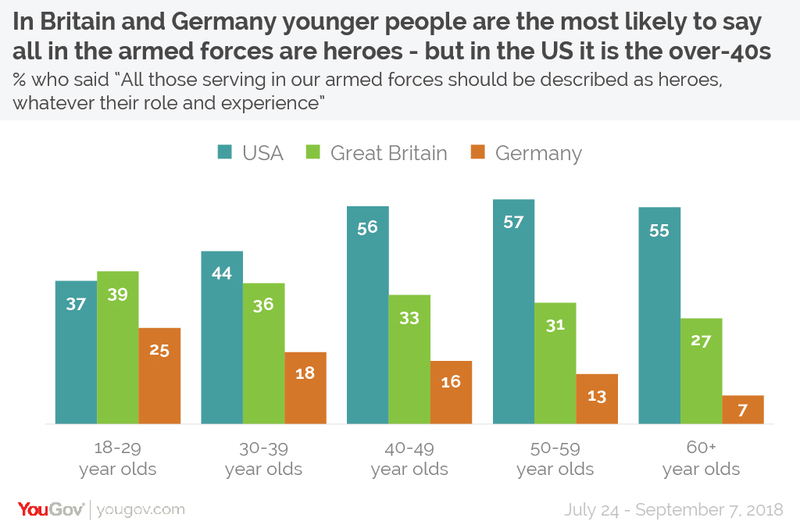 By contrast, in the UK and Germany it is the younger generations who are most likely to believe that all who serve in the armed forces are heroes. In the UK 39% of 18-29 year olds gave this answer – a figure which fell with ever age group down to 27% of 60+ year olds. In Germany the figures are 25% of 18-29 year olds falling to 7% of 60+ year olds. The motivations of older generations in the two countries are different, however. In Britain older people are more likely to answer that only those troops who had performed brave acts should be described as heroes (37%). In Germany, by contrast, 60+ year olds are most likely to say that no members of the armed forces should be described as heroes (44%) – no doubt a result of war guilt being more present among older Germans. In the UK the divide seems to be more between Remainers and Leavers than along traditional party lines, with little difference between the views of Labour and Conservative voters (although Liberal Democrats are markedly different). Leave voters are more likely to describe all troops as heroes (36% vs 25% of Remain voters), while Remain voters were more likely to say that only those in the armed forces who have performed particularly brave acts are heroes (37% vs 28% of Leavers). 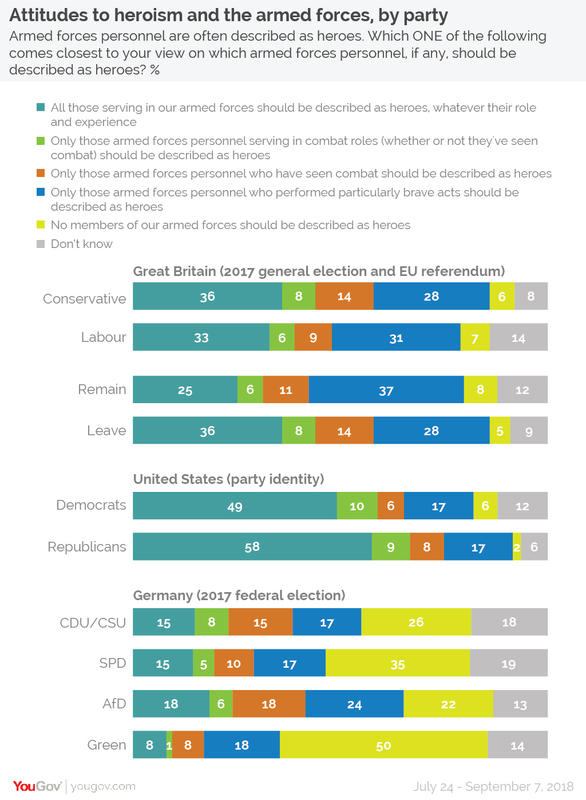 In Germany, AfD voters are the least likely to say that none of the troops are heroes, at 22%, and are the only group for whom this answer is not the most commonly given. By contrast, 26% of CDU/CSU say that no troops are heroes, 35% of SPD and 50% of Green. In the US, Republicans in particular are likely to say that all the troops are heroes, at 59%. Democrats are closer to the national average at 49%, with Independents being less likely at 42%. 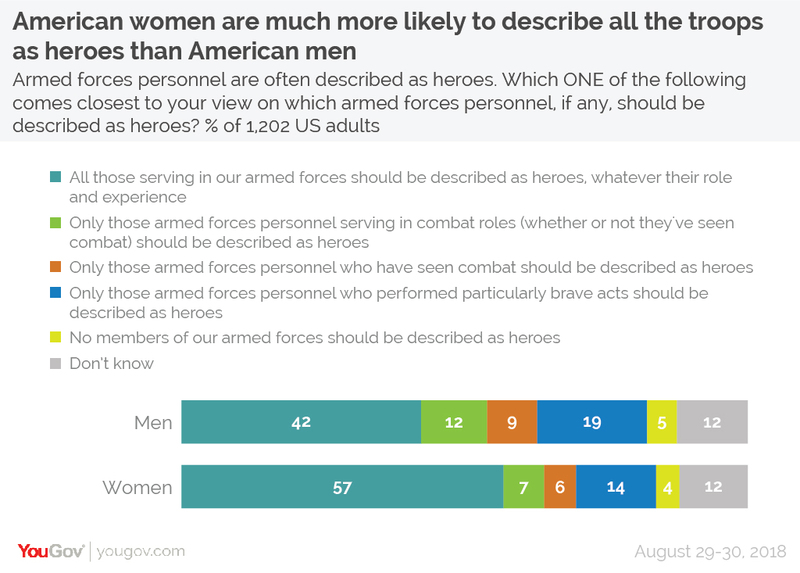 Women in the US are substantially more likely than men to consider all the troops heroes, with a fifteen percentage point gap between the genders (57% of women vs 42% of men). In the UK, the most notable gender differences are that women are more likely to consider all armed forces personnel as heroes (36% to 28% of men) while men are more likely to say that only those who have performed particularly brave acts are (34% to 28%). Differences between men and women in Germany are less pronounced, with the largest being that 24% of German women answered “don’t know” compared to 16% of German men.